When appearance, product visibility and recycled content are your priorities, choose Bare® Eco-Forward®. Crack- and shatter-resistant, sturdy and durable RPET provides increased functionality. Crystal-clear, almost glass-like in appearance, they're perfect for just about any non-frozen cold beverage: iced coffee, lemonade, soft drinks and more. Supporting the use of post-consumer recycled content is a key tenet of the SOLO® Eco-Forward® platform. Eco-Forward® offerings include products made with recycled PET water bottles and food containers as well as paper collected from offices and school recycling programs. Cup Type: Cold; Capacity (Volume): 12-14 oz; Material(s): RPET; Color(s): Clear. Made from 20% Post-Consumer Recycled Material. FDA Compliant Material. 12 oz. 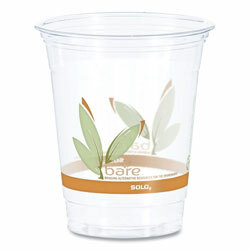 Plastic Cups from Solo Inc.! 501 In Stock today.